Rocket Matter Knowledge Base LawToolBox - Court Rule CalendaringHow to integrate my existing LawToolBox account with Rocket Matter. 1. Choose your jurisdiction and activate and accept license agreement. 2. **IMPORTANT** Activating and accepting the license agreement will authorize an additional LawToolBox charge from Rocket Matter. If you have an existing account, go ahead and accept the charge during setup, then please call Support at 1-888-432-1529 to avoid duplicate fees. You will be asked to provide your LawToolBox account number. 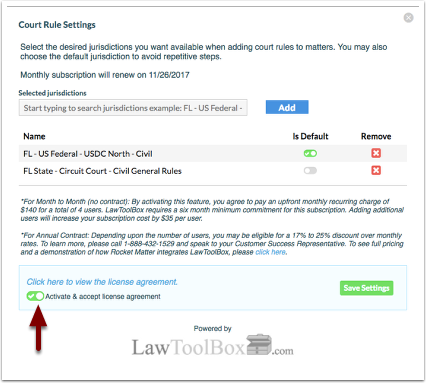 Prev: How to get started with the LawToolBox integration. Next: How to add a rule for court rules calendaring for a specific matter.